Dark squarish markings extend upwards from the belly onto the sides of the body between the dorsal blotches. The belly is light-colored with darker blotches and half moons. The scales are keeled and there are 25-33 dorsal scale rows at midbody. The pupil is round. Juvenile coloration is similar to that of adults. 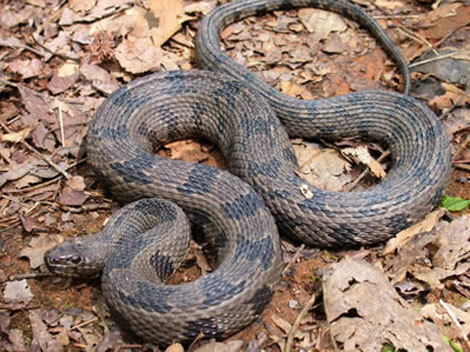 In Florida, the Brown Water Snake is found throughout the state, excluding the Florida Keys. Outside of Florida, it is found from southern Alabama northeast to southeastern Virginia. Commonly found in rivers, cypress strands, sawgrass prairies, swamps, lakes, ponds, canals, and flooded stands of melaleuca. HARMLESS (Non-Venomous). The Brown Water Snake is a good climber and can found 20 feet up in trees, though it is most frequently seen basking on tree limbs that extend above the water. When frightened by a rapidly approaching boat, it will escape by jumping off the limb into the water. Occasionally its attempt to flee comes too late and they fall not into the water, but into the boat.